In April of 2010, Secret Stash Records traveled to Lima, Peru in search of music to bring back to the U.S. and share with the world. While down there, they asked everyone they talked to about Peruvian funk music. No one had any idea what they were talking about. 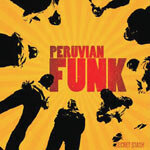 Convinced that some form of funk had to exist in Lima during the 70's, and determined to find it, they continued to inquire everywhere they went. After much searching, they finally stumbled over some by total accident. A local man was helping sort through stacks of records in a run-down garage when he handed over a pile of what he called rock records. Most of the stuff was psych and pop from the 60's and 70's. But, as it turned out, a few were straight up funk. This compilation brings together the funkiest cuts they found that day in Lima. ''The mix of Latin jazz, soul, and hard funk found in these recordings makes for one of the most fun records we've ever had the pleasure of releasing. We hope you enjoy it as much as we do.'' Limited press on yellow colored vinyl and comes with the MP3 downloads!